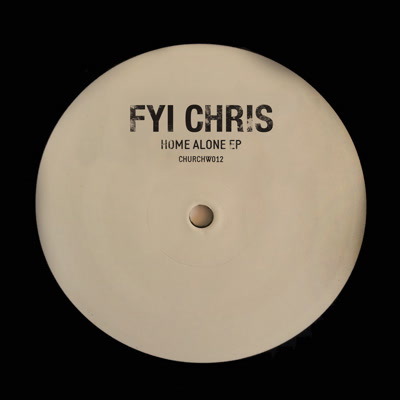 FYI Chris are a small collective of producers taking Londinium by storm with a string of well-received deep house releases over the last three years. Following efforts on South London’s Rhythm Section and Bristol’s Banoffee Pies, they’ve taken to Church for their latest outing. Opener ‘Home Alone’ stands out for its reverb-soaked trumpet musings that soar over lo-fi breakbeat drums and hints of strings, a siren call at twilight to take to the streets. The starry, pulsating interludes of ‘House Dog’ circle like smoke, and B2, ‘Courtyard’, is a voyage through the vast territories of space with a silken touch. Go get it now: ‘Home Alone’ is a deep, expertly-produced EP with a galactic touch, working like magic in solitary pursuits and togetherness. Home Alone is available on vinyl at Juno, or the Church bandcamp page for mp3. Alternatively, support your local discerning vinyl dealer.